Age 14/15? | 1982/83? Luke crash lands on Dagobah. Doesn’t he have infra-red, or space-radar? It’s mostly action on this page. Panel 2 and 3 are a bit too similar for a comic layout, but perhaps I was going for a more of a frame-by-frame cinematic look. Two frames of the same shot. Before and after? I seem to have abandoned colour again in this and the previous page. I’m not sure that it’s due to my laziness. I feel that I might have been concentrating more on drawing again. Perhaps each time I took a jump forward in drawing ability, colour was given a back-seat for a while—as I revelled in my new-found powers! Whoo-ha-ha-ha-haaaaa! I was out with 2 of my best pals for a couple of drinks last night, and Padhraig mentioned that the new verdict on Facebook Pages is that they’re useless for businesses. I’m not that surprised to be honest. I imagine if they’re going to get any traction, you need to either be A. Already Successful, or B. Pour tonnes of cash into Facebook to boost its visibility. This isn’t a business, so I’ve no intention of handing over money to Facebook. I dislike Facebook anyway (for lots of very good reasons). Padhraig said that Facebook Groups are better. And I can imagine that they would be. I originally set up a Group for my Between * Wars, 1970s style webcomic, and it was great. There was lots of interaction with readers, and lots of contributions from the readers to the page. They could post on there themselves. After about 6 months, it dawned on me that Facebook Groups are not public! You could only see them if you were a Facebook user and member of that group! Missing the point, I closed it, and set up a Facebook Page instead thinking that its visibility would be better. Mistake. Interaction and interest dropped off. It made sense, because the Pages are not closed, but can be looked at by anyone on the internet—I think even people who aren’t Facebook members! And can probably be accessed by nefarious bots and data-scrapers too. (even more so than Facebook itself). So, I might set up a Star Wars age 9 Group (using my new anonymous Facebook profile, «because I deleted my personal profile a couple of weeks ago after the Cambridge Analytica story blew up). Is it worth it though? I mean, hardly anyone even looks at this site. I am thinking of publishing 2 other silly Star Wars comics on here too over the coming years. 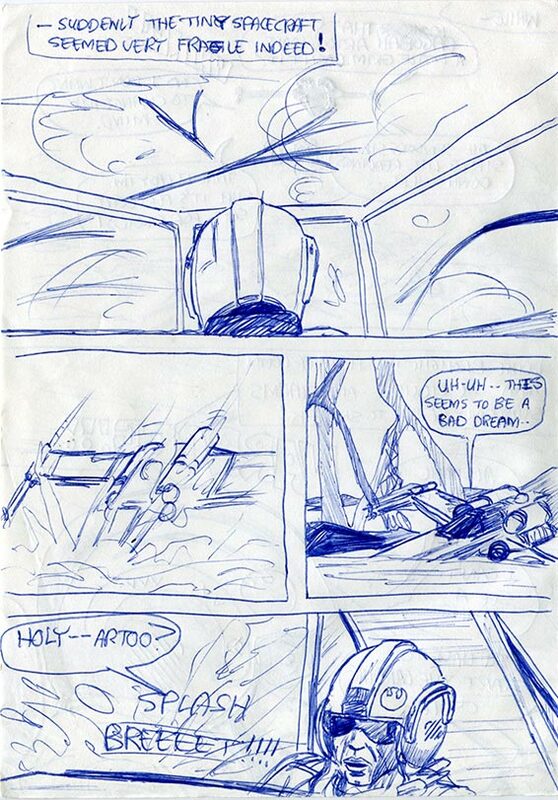 And maybe I’ll even a re-tell ‘Star Wars’ using the hundreds of other individual Star Wars drawings that I still have, and can piece together into what might be a very funny adaptation. Post your comments below—if you’ve enjoyed it. Thanks.